All Natalie Gunshannon wanted was to be paid a fair wage for her work, she said. Her future earnings would be deposited into the debit card account and she could access her money from there. Gunshannon never signed the card and when she returned to work she asked her supervisor if she could be paid by check or by direct deposit. She was told the card was the only option. 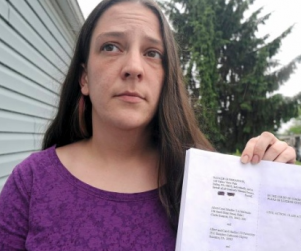 Gunshannon, a single mother of one daughter, quit her job at McDonald’s and went to see an attorney, Mike Cefalo of West Pittston. A class-action lawsuit was filed Thursday in Luzerne County Court by Cefalo on behalf of Gunshannon and other employees, seeking damages, fees and costs. Gunshannon said she didn’t sign the card and chose to not enroll in the payroll system offered because she felt the fees would be exorbitant and actually drop her earnings below minimum wage. She was to be paid about $7.44 per hour – her paystub didn’t list her hourly rate. Minimum wage is $7.25. According to the complaint filed, the JP Morgan Chase payroll card lists several fees, including a $1.50 charge for ATM withdrawals, $5 for over-the-counter cash withdrawals, $1 per balance inquiry, 75 cents per online bill payment and $15 for lost/stolen card. Gunshannon said she had taken her concerns to the main office of the franchise holder – Albert and Carol Mueller, trading as McDonald’s, in Clarks Summit. She was told that the card was the only option, she said. In a statement issued by public relations coordinator Beth Dal Santo, the Muellers declined to comment on the suit, stating they had not seen a copy of the complaint. Cefalo said many more people are coming forward and telling the same stories. Pennsylvania law states employees are entitled to have a choice to be paid by check or cash, he said. “When they work hard and earn their wages, why should they have to pay fees to collect their rightful wages?” Cefalo asked. Gunshannon said she is looking for another job and the first question she asks is how employees are paid. “I need to receive all the money I earn,” she said.